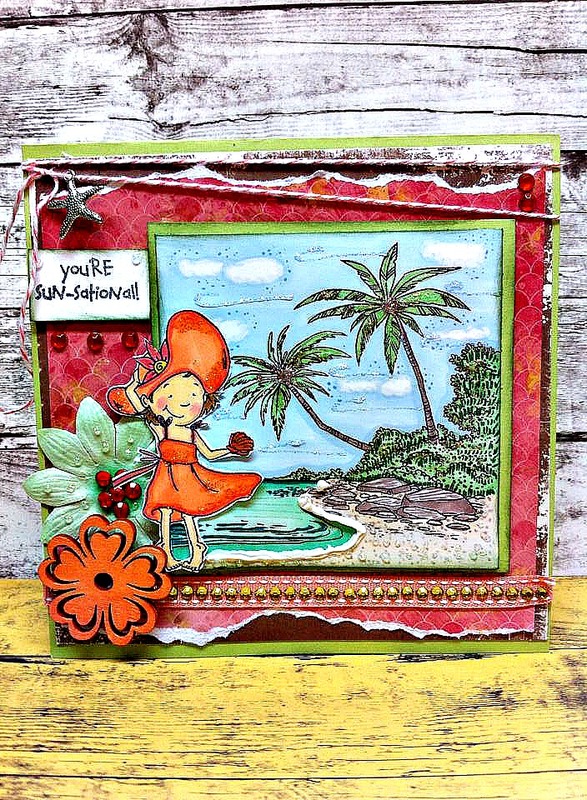 I just love this stamp and I have created quite a few cards with her already. It has been so much fun being a "GUEST DESIGN," Team Member for June. Now did you hear the news? 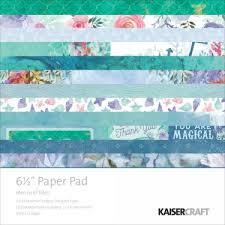 Kraftin' Kimmie Stamps has a wonderful new website. Yes, it's easy to navigate and there are so many wonderful things to see and stamps to purchase. One feature that Kim has put on the site is a Customer Card Showcase. All you need to do is follow the challenges, ie: Wonderful Wednesday and Saturday challenges for a chance to win a prize and to be featured on the website. How wonderful is that?! Oh but that's not all.... KIM HAS GIFTS FOR YOU! From Kim: " EVERY order placed this weekend will receive a special little extra something in their package!!! Could be a stamp, maybe buttons, sequins, enamel dots, flowers, brads....who knows! It'll be a fun SURPRISE!!! I just want to say THANK YOU for being such an amazing and loyal customer to Kraftin' Kimmie Stamps!!! 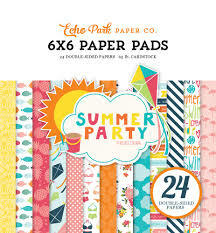 THIS IS EXCITING...you can also get the NEW JUNE GIMMIE KIT..that's all the June stamps for a wonderful deal. 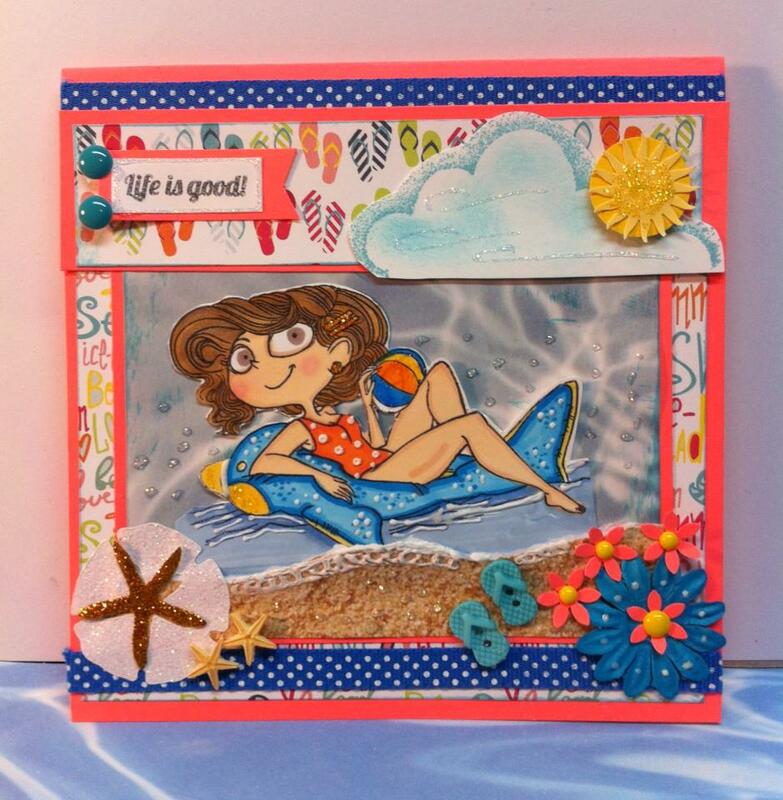 Please check out the store: http://www.kraftinkimmiestamps.com Being a GUEST DESIGNER this month had it's perks. Each of us who signed up received the Fabulous, "FLOATIN' FIONA," a pad of 6x6 paper, Enamel dots, twine, flowers, washi tape, sequins, buttons and beautiful sea shell embellishments. It was like Christmas in a box. Kim will be hosting another Surprise Kit in September. Keep your eyes on the Blog, Facebook and Store. We were offered the June Release stamps early so that if we chose to create some cards for the release we could join in on the fun!!! Here are two of the cards that I created tonight. This one is DOLLY DIVER.....by Annie Rodrigue...Tee hee! Look at the little Squid hitchin' a ride. 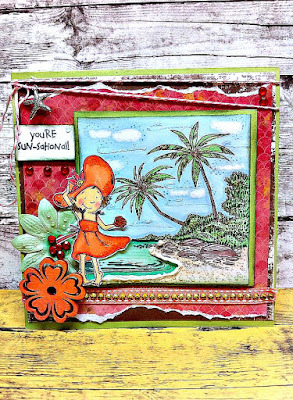 The June stamps are now available at the store... don't forget the surprise with your order and to keep an eye out on Kraftin' Kimmie Stamps' Krafty Friends! 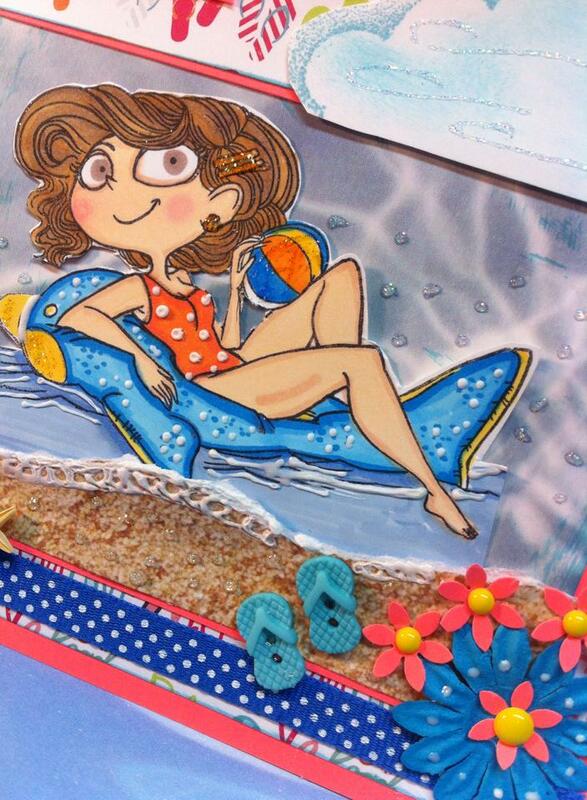 MATERIALS USED: FLOATING FIONA: Echo Park's Summer Party 6x6 Paper pad and Enamel Dots. Prima flower, button flip flops, Ribbon, embellishments from Michaels. Liquid Applique for the sea foam and Star Dust Stickles for added shine. 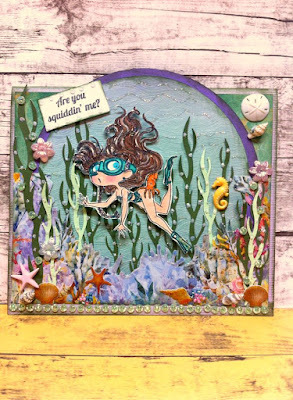 DOLLY DIVER and You're Sun-sational card paper is Kaisercraft's, "Mermaid Tails." You did a great job, Anabela! I love how you created the scene's!! Beautiful cards!!! Love these! How awesome! Looks like you had A LOT of fun!!! oh wow! such beautiful cards!